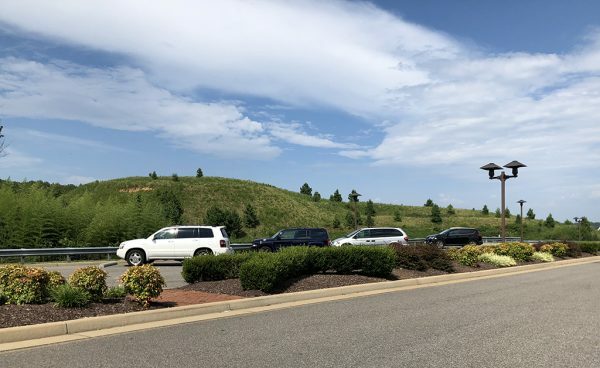 A large mound of dirt at the entryway to one of Chesterfield County’s largest retail developments soon may give way to more apartments, as another local real estate firm is looking to further fuel the county’s apartment craze. Richmond-based Rebkee Co. is planning to construct up to 250 apartments at 15800 City View Drive near the Westchester Commons shopping center, according to a development application filed with the county’s planning division. The project would rise on 11 acres of a 15.4-acre tract across from the Shoppes of Westchester, and west of the first traffic circle at Watkins Centre Parkway and City View Drive. Coined Westchester II, the development is set to include four buildings at a maximum height of five stories, the documents show. The project also will include a 5,000-square-foot clubhouse with a pool, walking trails, dog park and fitness center. A cost estimate and construction timeline for the project were not disclosed. A site plan for Rebkee’s project. Rendering by CPA. Rob Hargett, Rebkee principal and co-founder, could not be reached for comment. The site falls within one of the county’s regional mixed-use designation areas, which allows for corporate office, commercial, light industrial/research and development, and higher-density residential uses. 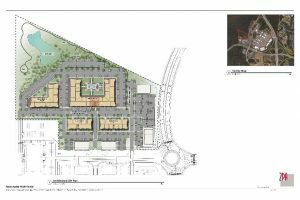 In March, the Chesterfield County Board of Supervisors approved amending the vicinity’s 786-acre regional mixed-use plan to accommodate the apartment development, which still needs a site plan. The remaining properties within the mixed-use area, which includes Westchester Commons and the Shoppes at Westchester, were not affected by Rebkee’s request. Rebkee has owned the site since 2008, paying $1.5 million, county records show. It most recently was accessed by the county for $2 million. It first filed plans to rezone the property for apartments in December 2017. With the addition of Rebkee’s project, more than 900 new apartments are poised to rise in the vicinity of Westchester Commons. Castle Development Partners submitted a preliminary site plan last week for its proposed 18-acre, 450-unit apartment project that will anchor part of Watkins Centre – a nearly 285-acre mixed-use development next door to Westchester Commons. With the exception of the apartment component, the remaining balance of the 285-acre development is being marketed by Commonwealth Commercial Partners for office space, light industrial, medical, community and neighborhood retail, and recreational amenities. Westchester Development Partners, made up of Chesterfield County developers Casey Sowers and George Emerson, is proposing two buildings totaling 236 apartments on a 5-acre parcel overlooking Route 288 at the northeastern edge of Westchester Commons. And beyond the Westchester area, hundreds more apartments are in the works around Chesterfield County. Guy Blundon of CMB Development is planning a $30 million, 240-unit apartment community on 11 acres at 5411 Commonwealth Centre Parkway near the Commonwealth Centre Parkway and Route 288 interchange in Brandermill. Work on Winterfield Crossing apartments is underway in Midlothian. Midlothian West, a development comprising 275 apartments and 170 townhomes, is in the works across the street. 1 Comment on "Rebkee jumping into Chesterfield apartment boom"
Class A Apartments are blooming everywhere in Chesterfield! Real estate taxes will be their fruit. And these in the article are about half of what’s in store.